Which of the new Pokemon Gen 8 Starters are you going to pick? With the duo of new Pokemon Switch games - Pokemon Sword and Shield - now tantalisingly close, it's time to get seriously excited about Pokemon Gen 8. 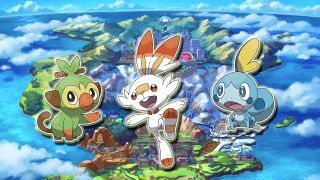 A whole batch of new Pokemon are arriving with the Galar region, which is based on the British Isles, and we've already had the Pokemon Gen 8 starters confirmed. Now it's just a case of waiting to see the E3 2019 games lineup reveal more of the new generation of Poke-critters. But for now, here are all the Gen 8 Pokemon we know of so far. Your first starter for Pokemon Gen 8 is Grooky, the Grass type monkey Pokemon. Described as a mischievous chimp that's "fill of boundless curiosity". Although we can only guess at its movesets for now, judging by the way it wields that stick it keeps in its hair, we imagine that that will be involved somehow. Scorbunny is a fire bunny, what more do you need to know right? It leaves fire in its tracks, and judging by all the bandaids we could be looking at a feisty, melee-focused, firestarter here. The internet has already fallen in love with Sobble, but if you're still unsure about this Water type starter, you need to know that he's actually a water lizard. Adorbs, right? Also, he can turn invisible in water. Got to be useful right? Of course, there are already some pre-announced Pokemon Gen 8 that we already know about. Originally it appeared in Pokemon Go, then you could transfer it to Pokemon Let's Go through the magic of a special box. But no doubt you're going to see it appear in Pokemon Sword and Pokemon Shield at some point. The evolution of Meltan is also another that's started life in the same way as its little Hex Nut brother, but again, its probably going to appear in Pokemon Shield and Sword. Will it be a Mythical Pokemon here too?